Weston and I wish to recognize the “right to common” as a human and legal right. 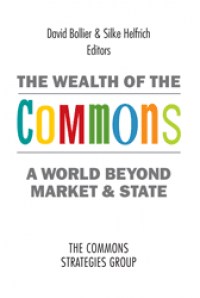 One advantage is that commons, once established, are more likely to actualize and guarantee this right in substance than reliance on national courts and international treaty organizations alone. 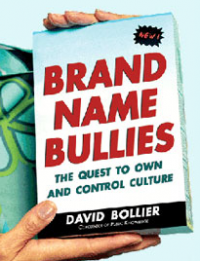 These traditional bodies, which have converged into an allied “market/state duopoly,” have a shared, vested interest in promoting market growth and corporate profitability. Because full recognition and enforcement of human rights can be embarrassing or economically costly to national governments and large corporations, governments and international courts are often reluctant to give human rights substantive force. Green Governance also proposes a rough framework for imagining a new architecture of law and policy to support the ecological commons. The International Association for the Study of the Commons has estimated that some two billion people around the world depend upon natural resource commons – forests, fisheries, irrigation water, farmland, game – to meet their daily needs. Yet legal recognition and support for these commons are minimal to nonexistent. 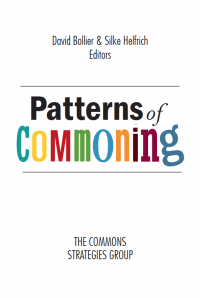 We think that it’s time to formally recognize and support the countless commons that now exist. 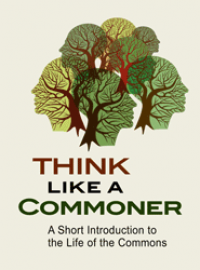 We need to enact new laws that facilitate the formation and maintenance of commons. This would not only be empowering to commoners, it would ratify ecological practices that could help reduce carbon emissions (vs. industrial farming practices or conventional market “development”). 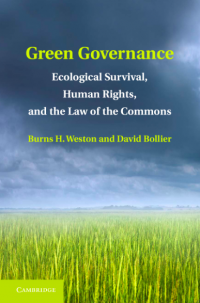 You can read more about Green Governance at The Commons Law Project website. For now, the book is only available as a rather expensive library-edition hardcover, but a paperback version should be available early next year. 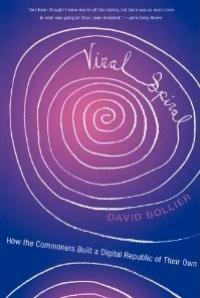 Francesca Rheannon, the incisive, progressive-minded host of Writer’s Voice, decided to combine her recent interview with me, with excerpts from my 2010 interview with her about my previous book,Viral Spiral: How the Commoners Built a Digital Republic of Their Own (New Press). So, a whole hour of talk about the commons! You can stream the show here and download it here. The show’s webpage on the interview can be found here.